The Rowan Organisation has a small team covering Conwy and Denbighshire, comprising of Karen Smith (Deputy Chief Executive Officer), Richard Roberts (North Wales Direct Payments Manager) and Independent Living Advisers; Jan Dodd, Fiona Owens, Mel Phillips and Jacqui Renwick. Between us, we have a wealth of knowledge and experience and our aim is to provide you with information and support with regards to Direct Payments. In the initial stages, we can provide general information about Direct Payments and of how they may suit your needs. Then, should you decide to proceed with Direct Payments, we can support you with the practical tasks such as opening a bank account, the completion of associated paperwork, recruiting new staff and of course, ongoing support to become, and continue to be, a good employer. We hope that in time, people receiving Direct Payments will benefit from increased confidence and independence and naturally, this will result in you requiring less support from ourselves. However, should your circumstances change for any reason, and you`d like a little helping hand, please feel free to contact us and we will pick up where we left off. Our Head Office is based in Coventry and we also have a Welsh office in Bangor, in order to provide our services bilingually. From here, payroll is processed for all welsh speakers in Wales. Payroll is also provided for some non-welsh speakers, and it is the hope that eventually, all welsh direct payments recipients will have their payroll processed in the welsh office. Head Office is manned between the hours of 9am and 5pm, Monday to Friday. The Welsh office is manned Monday to Thursday 9.00am til 5.00pm and from 9.00am til 4.30pm on Fridays. You can e-mail the Information Service. Would you like to meet other people who receive direct payments in Conwy or Denbighshire? The Conwy and Denbighshire Peer Support Group offers DP recipients with a great opportunity to both provide, and receive support from others. The best people to offer guidance on a subject such as Direct Payments are always those who have first hand knowledge and experience. Peer Support Groups offer an invaluable opportunity to share ideas and suggestions as to how things may be improved...not only between yourselves, but to us, The Rowan Organisation, to your Local Authority and to other local community and voluntary organisations. The group gives a great opportunity to meet and provide mutual support to fellow Direct Payments users, discuss matters of concern, share ideas and good practice and the opportunity to socialise. Unfortunately the Support Group for Conwy & Denbighshire no longer meet due to lack of support and resources. If you are interested in starting a local group please speak to your local ILA or contact our Information Service on 02476 322860. Denbighshire County Council is committed to ensuring that Direct Payments will be offered to all those who meet the eligibility criteria, as a way of meeting assessed care needs. To find out more about Direct Payments in Denbighshire, please visit their website here or telephone Denbighshire County Council First Contact Team on 01824 712900. Newyddion da diweddar i gwmnïau cydweithredol bach yng Nghymru! 1. Gall teuluoedd, gofalwyr a phobl sy'n cyflogi eu gofalwyr personol eu hunain bellach uno i ffurfio cwmni cydweithredol. Gall cynorthwywyr personol bellach gael eu cyflogi gan y cwmni cydweithredol a chynorthwyo aelodau'r cwmni cydweithredol. Ni all y cwmnïau cydweithredol hyn ddarparu gofal a chymorth i fwy na phedwar o bobl. Cyn y newidiadau diweddar i reoliadau, byddai'r math hwn o gwmni cydweithredol bach wedi gorfod wynebu'r un lefel o reoleiddio â sefydliad gofal cartref mawr. 2. Gall Cynorthwywyr Personol bellach ddod at ei gilydd i ffurfio cwmni cydweithredol er mwyn cefnogi ei gilydd ac i hysbysebu eu gwasanaethau i deuluoedd a dinasyddion. Ni fydd y trefniant hwn yn cael ei reoleiddio. Beth yw'r gwahaniaeth rhwng cwmni cydweithredol a busnesau preifat sy'n cynnig gwasanaethau gofal a chymorth? Mae cwmni cydweithredol yn eiddo i'w aelodau, pobl sy'n derbyn gwasanaethau gofal a chymorth, eu teuluoedd, eu ffrindiau a phobl sy'n gweithio fel Cynorthwywyr Personol, a nhw sy'n ei reoli. Mewn cwmni cydweithredol, mae'r bobl sy'n derbyn gofal a chymorth yn berchen ar y sefydliad ac mae ganddynt reolaeth drosto, ac maent yn chwarae rhan lawn mewn penderfyniadau strategol a hirdymor. Mae pobl yn parhau i reoli eu gwasanaethau, gan gynllunio pecynnau cymorth yn seiliedig ar eu gofynion personol eu hunain. Ym mha ffordd y bydd cwmni cydweithredol o fudd i mi? Mwy o gyfleoedd i gwrdd â phobl eraill sy'n aelodau o gwmni cydweithredol er mwyn rhannu gwasanaethau cymorth, cymdeithasu a threfnu gweithgareddau gyda'ch gilydd. Cyfuno Taliadau Uniongyrchol ac adnoddau eraill i brynu cymorth gan Gynorthwywyr Personol ac i rannu gweithgareddau cymdeithasol. Gall cymryd rhan mewn cwmni cydweithredol eich helpu i gyflawni eu lles unigol drwy gynyddu eu hannibyniaeth, gan roi cyfleodd newydd ar gyfer dysgu, ehangu eu rhwydweithiau cymdeithasol, chwarae mwy o ran yn eu cymuned a chael y cyfle i helpu eraill. Cynllunio ar gyfer eich trefniadau gofal a chymorth yn yr hirdymor er mwyn iddo barhau yn y dyfodol. Bydd bod yn aelod o gwmni cydweithredol yn ei gwneud yn haws i Gynorthwywyr Personol gynnig eu gwasanaethau i nifer o wahanol bobl sydd hefyd yn aelodau o'r cwmni cydweithredol. Mae hyn y caniatáu mwy o hyblygrwydd ac hefyd yn ei gwneud yn haws i bobl sy'n aelodau ddod o hyd i gymorth Cynorthwyydd Personol. Gall teuluoedd, gofalwyr a phobl sy'n defnyddio Taliadau Uniongyrchol ddod at ei gilydd i sefydlu cwmni cydweithredol a fydd yn cyflogi Cynorthwywyr Personol. Mae hyn yn ddatrysiad amgen i un person fod yn gyfrifol am gyflogi Cynorthwywyr Personol. Gall y cwmni cydweithredol nawr gyflogi Cynorthwywyr Personol yn ei enw ei hun a gall gytuno ar sut i reoli a rhannu ei gymorth ymysg ei aelodau. Mae Cydweithredu i Ofalu yn gweithio gyda'r ‘Family First Co-operative’ sef y grŵp cyntaf yng Nghymru i fabwysiadu'r math hwn o fodel cydweithredol. Rydym wedi gweithio gyda'r grŵp hwn er mwyn symud drwy'r camau sy'n ofynnol i ffurfio cwmni cydweithredol llwyddiannus. * Bydd y rheoliadau cael eu trafod gan Lywodraeth Cymru ym mis Rhagfyr a dônt i rym ym mis Ebrill 2018. Recent good news for small co-operatives in Wales! 1. Families, carers and people who employ their own personal assistants can now join together to form a co-operative. Personal assistants can now be employed by the co-operative and can provide assistance to the members of the co-operative. 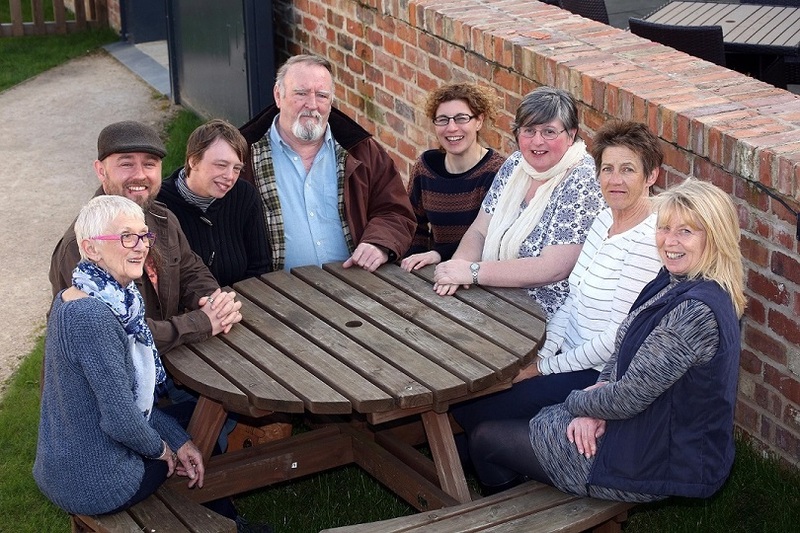 These co-operatives can provide care and support to no more than four people. Before the recent changes to regulations, this type of small co-operative would have faced the same level of regulation as a large domiciliary care organisation. 2. Personal Assistants can now join together to form a co-operative for to support one another and to advertise their services to families and citizens. This arrangement will not face regulation. What’s the difference between a co-operative and a privately owned businesses offering care and support services? A co-operative is owned and under the control of its members, people who are receiving care and support services, their families, their friends and people who work as Personal Assistants. In a co-operative, the people who receive care and support have ownership and control over the organisation, and are fully involved in strategic and long-term decisions. People stay in control of their services designing packages of support based on their own personal requirements. How will a co-operative benefit me? More opportunities to meet with other people who are co-operative members to share support services, socialise and plan activities together. Pooling of Direct Payments and other resources to purchase support of Personal Assistants and for sharing social activities. Participation in a co-operative can help you better achieve your individual well-being by increasing your independence, giving new opportunities for learning, growing your social networks, playing a bigger role in your community and having the chance to help others. Planning for your care and support arrangements for the long-term so it continues into the future. Being a member of a co-operative will make it easier for Personal Assistants to offer their services to a number of different people who are also members of the co-operative. This allows greater flexibility and also makes it easier for people who are members to find Personal Assistant support. Families, carers and people using Direct Payments can get together to set up a co-operative that will employ Personal Assistants. This is an alternative solution to one person being responsible for employing Personal Assistants. The co-operative can now employ Personal Assistants in its own name and can agree how to manage and share their support amongst its members. Care to Co-operate is working with the ‘Family First Co-operative’ who will be the first group in Wales to adopt this type of co-operative model. We have worked with the group to move through the stages required to form a successful co-operative. * The regulations will be debated by Welsh Government in December and come into force in April 2018. 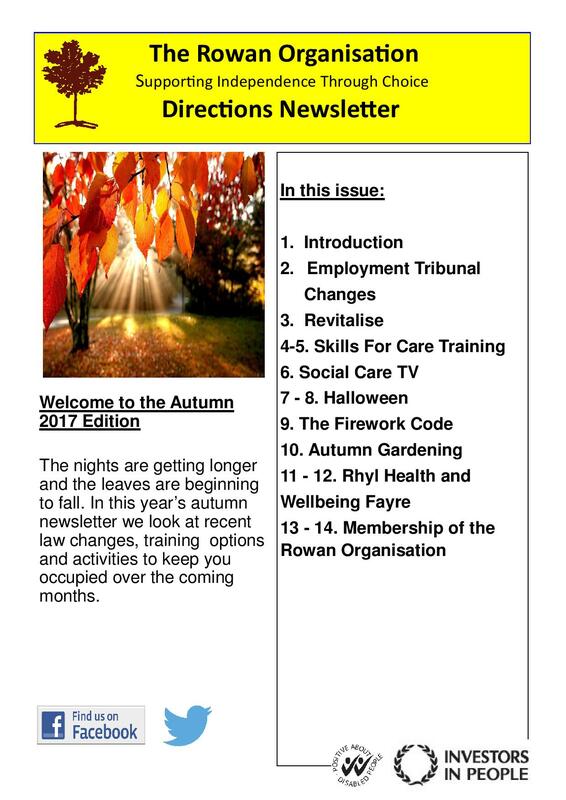 Please find our Autumn Newsletter below. Please click on the image to open the letter. There is a new PA Guidebook available and it can be found www.paonlineguidebookwales.co.uk. Yn ddarparwr hyfforddiant ansawdd, proffesiynol a chost-effeithiol gyda swyddfeydd yn Sir Ddinbych a Chonwy ac sydd â'r gallu i ddarparu hyfforddiant ar draws Gogledd Cymru. Are a quality, professional and cost effective training provider with offices in Denbighshire and Conwy and have the capabilities to deliver training across North Wales. Y Safle Cenedlaethol ar gyfer Anhwylderau Sbectrwm Awtistiaeth (ASD). 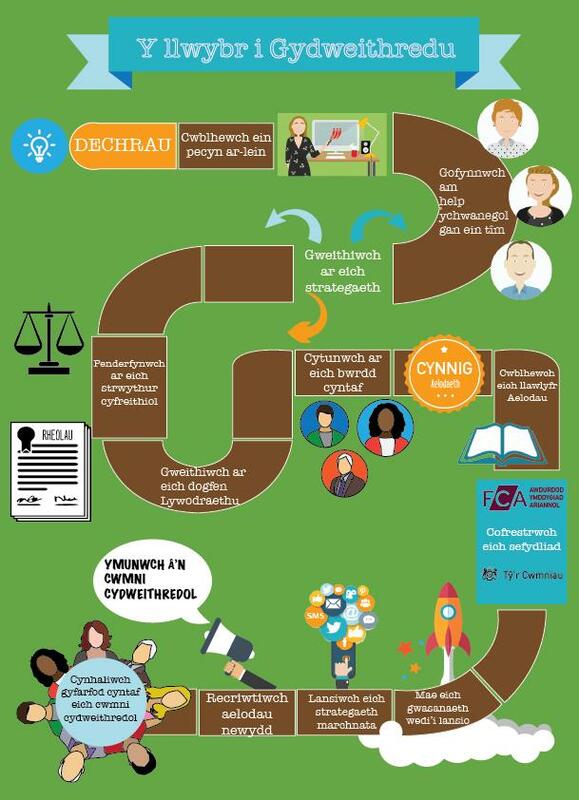 Yma fe welwch wybodaeth am fanylion y gwasanaeth, anawsterau hyfforddi a diweddariadau ar weithredu'r Cynllun Strategol ASD ar gyfer Cymru ynghylch Anhwylderau'r Sbectrwm Awtistig (gan gynnwys Syndrom Awtistiaeth a Asperger). The National Site for Autism Spectrum Disorders (ASD). Here you will find information about Autistic Spectrum Disorders (including Autism and Asperger’s Syndrome) service details, training opportunities and updates on the implementation of the ASD Strategic Plan for Wales. Cynnig cyrsiau hyfforddi amrywiol ar bynciau megis Cymorth Cyntaf a Chodi â Llaw, fel arfer ar gost o £35 y person bob dydd. Offer various training courses on topics such as First Aid and Manual Handling, usually at a cost of £35 per person per day. Do you need money for for training? If you employ your own care and support staff using a social care budget or your own money you can apply to Skills for Care to get money for training for you and your personal assistant. The money that is available is called individual employer funding. To apply for the money and for further information please click here. Brought to you by UK Fundraising, WCVA, Institute of Fundraising and the Wales Millennium Centre, this ‘unconference’-style event is ‘informal and relentlessly practical’ and completely shaped by the fundraising questions you want answered! Spend a day learning, talking about and maybe even solving the issues and challenges you face in your fundraising. Learn from other fundraisers in your area, find out how they've dealt with similar problems, and share your experience. Find out more about this unique event and book your place by clicking on the link above. For further Events and Training dates please click here. For UNISON MEMBERS working in a social care setting, e.g. local authority, private or charity-run/voluntary aided homes or employed directly by individuals. Welsh Council for Voluntary Action - Training and events digest. Get the knowledge, skills and confidence to plan, prepare and deliver training sessions with this three day accredited course. One of our most popular courses, Training Skills gives you an overview of learning theory, provides practical planning tools for designing and evaluating, and helps prepare you for delivering your training. The course is ideal for those who are new to training and/or may have taken on a training role in their organisation for the first time. For further information and details please click here. Betsi Cadwaladr University Health Board are pleased to offer Leadership & management, Manual Handling and Violence & Aggression training. If you would to make a booking or further information regarding available courses or room hire across North Wales, please e-mail ABH.TrainingGroup@wales.nhs.uk. The CADCentre UK Ltd is an approved training provider working in partnership with the Welsh Government to deliver the Work Based Learning training scheme. The aim of the scheme is to provide high-quality vocational training and assessment without incurring any financial costs to the employer whatsoever. The training courses are FREE OF CHARGE and, after successful completion, the staff will receive City & Guilds certification. The training is predominantly for Welsh speaking staff, however if you have English speaking staff who are interested they can work on a 1:1 ratio. Using IT - This course is suitable for all employees who use a computer on a daily basis. The qualification consists of training in Microsoft Office (Word, Excel, Outlook, etc) along with Improving Productivity by Using IT and IT User Fundamentals. (There is also an advanced course for competent IT Users). Business & Administration - This course is suitable for any staff in an administrative position. The qualification covers a wide range of topics from managing customer relations to using IT systems. Customer Service - This course is for staff who are responsible for delivering customer service and who interact directly with the customer, for example sales or retail staff, staff working on service desks, call centre staff, etc. (This course is only available through the medium of Welsh). Keyskills - Communication and Application of Number Keyskills are delivered alongside the qualifications and are at levels 1 or 2. Not on any other scheme which is funded by the government. For further information on the courses or to find out more please call Shareen Jarrett directly on Freephone 0808 2000 129 or you can e-mail shareen.jarrett@cadcentreuk.com. Denbighshire County Council is pleased to offer free training to Direct Payment Recipients and their staff, free of charge. 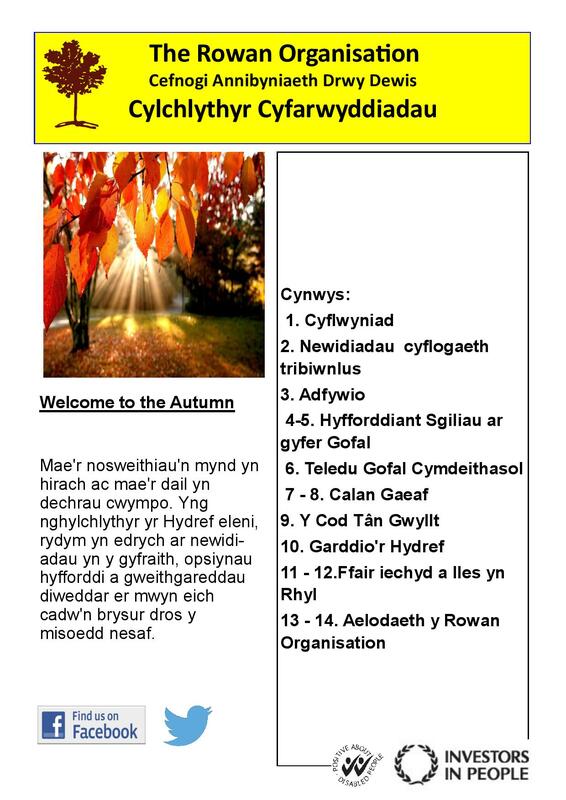 Alternatively, we can support you to identify courses with the local colleges, such as those offered by Llandrillo. G2G Communities are offering training courses and Open University flexible training courses, some of which may be free. All courses are supported and flexible with drop in sessions and virtual support. More information is available in their leaflet. Click here to go to go to our vacancies page. Coming soon our resource directory. The Rowan Organisation is a Registered Charity (Registration No. 1017932), registered in Cardiff and a Not for Profit Company Limited by Guarantee (Company Registration No. 2783681). Registered Address: The Rowan Organisation, Unit 7, Colliers Way, Old Arley, Coventry. CV7 8HN.